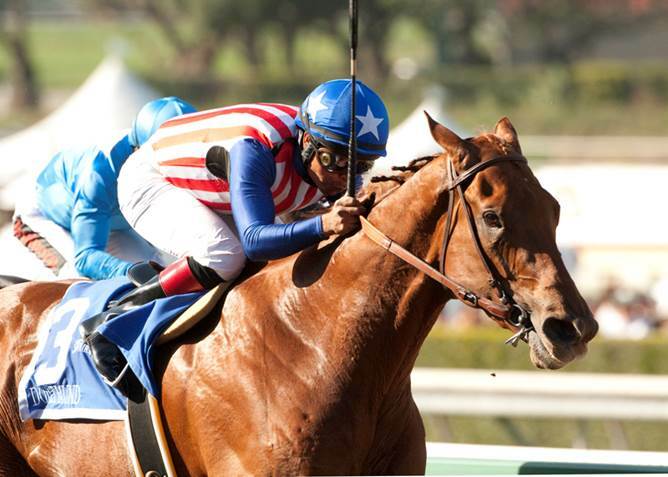 #1 Dortmund (3-5): Deserving heavy chalk just beat a few of these when he ran his record to 5-for-5 in the local GII San Felipe last month and looks like he’s going to be a handful right back as he tries nine furlongs for the first time. Imposing physical specimen is tactical enough to be on or just off the lead, and with a speedy Baffert stablemate next door and cheap speed out wide, you could see this son of Big Brown taking back ever so slightly and then getting a three-over stalking trip that will enable first run off the far turn. The chinks in his armor—if there are any—have yet to arise and he was a comfortable 1 1/4 lengths ahead of Prospect Park last time even though he was pressured on the lead, so with just an extra half-furlong to negotiate and basically the same crew he just handled, you have to think it’s 6-for-6 after this one; won’t try to beat him, today. #2 One Lucky Dane (5-1): Potential inside speed looked great winning his first start since he was sixth in the BC Juvenile here in November when he blitzed an overmatched optional claiming group over the track two weeks ago and gets thrown right into the deep end of the pool by Baffert. Lookin At Lucky colt has a reputation of beating up on softies (see his similar romp in an MSW win here in October), but the only time he faced stakes foes, in the Juvenile, he was beaten pretty soundly, so he’s got some growing up to do. If he clears on the lead then maybe he could get brave, but it’s doubtful that’s happening with a stretch-out sprinter to the outside, which means that he’s probably going to have to swat that runner early then fend off Dortmund and Bolo while bracing for ‘Park’s late run, which isn’t a very appealing scenario; minor award appears his ceiling. #3 Cross the Line (15-1): Hollendorfer longshot sure picks a tough spot to make his dirt debut, though dad Line of Thunder won the Arkansas Derby a few years back, so at least he’s bred for it. Exits a solid, if unspectacular, run in the GIII El Camino Real Derby at Golden Gate Fields on the Tapeta, and he did have some trouble that day, too, but winner Metaboss came back to run sixth in the GIII Spiral at Turfway Park, so the quality of that Northern California Derby is highly suspect. Fans of the King will get their guy at a big price and you have to find out at some point if your colt can dirt, but this just isn’t the right kind of spot to make a dent; can’t see it. 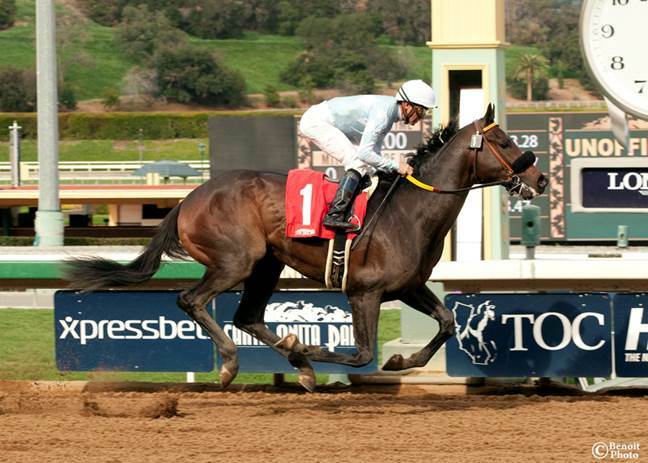 #4 Bolo (4-1): Dangerous sort was thought to be a turf horse after two rousing wins over the grass here this winter, but he was a game third in the San Felipe in his dirt debut, and only missed second in the waning strides, so he’s got every right to improve off that trial run. Of course, he better improve if he wants to beat Dortmund and ‘Park, and the way he shortened up stride late last time isn’t a recipe to get nine furlongs today. At least dad Temple City was a long-distance dirt runner out here earlier in the decade, Gaines has quietly enjoyed a nice meet, too, and he should be tracking/pressing the chalk from the outside the entire way, but at this trip, the gut says the gap between him and Dortmund and ‘Park will be getting bigger, not smaller; third-best again. Prospect Park and Kent Desormeaux. Benoit photo. #5 Prospect Park (7-2): Long striding son of Tapit took a while to get going in the San Felipe, but when he did, he was able to wrestle second away from Bolo late, though not really threatening Dortmund. He also didn’t exactly have his mind on running through the lane, as he seemed to be going sideways as much as forward until he straightened out late, so he’s still a bit of a work in progress for Sise, who has taken him from a MSW win in late December to a major Kentucky Derby contender by mid-March, which is a nice rise. And the nine furlongs he gets today also figures to help bridge the gap to Dortmund, plus the pace should also work to his benefit, as he can track the proceedings early and make a run off the far turn late. On paper he’s second-best and under the line he’s probably that way, too, but this is a means to an end because when he hits Louisville and gets 10 panels, they’ll all be playing his game; looms the main danger. #6 Bad Read Sanchez (30-1): Aforementioned sprinter makes his first start past six furlongs and first start since August, and you have to wonder if the racing office came knocking on O’Neill’s door, told him they only have five so far, and asked if he had anyone to run, because is one odd spot to return. If you’re searching for positives, he did win off works (by 10) in his debut over the track in June, and his pedigree—he’s by Warrior’s Reward out of a Pulpit mare–says this trip is within his scope, but that’s about all you can come up with. Expecting that he’s gunned to the lead and tries to get brave and hope they forget about him up front, but they could give him a 15-length head start and let him go in :52 and he still would be hard-pressed to run fourth; get home safely.